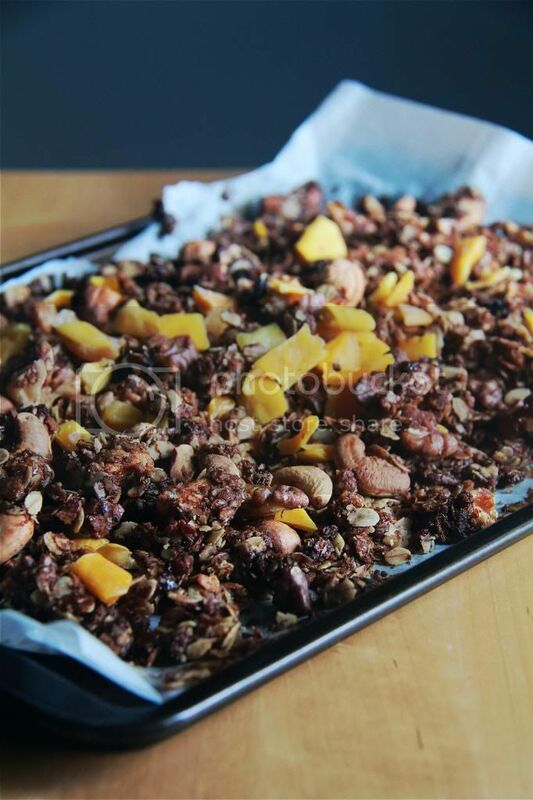 Crumbs and Cookies: gula melaka granola. I'm not sure if it's my infrequent posting that has led to a deterioration of my writing skills or the fact that this granola is so darn good that I can think of only very little to say in this post. 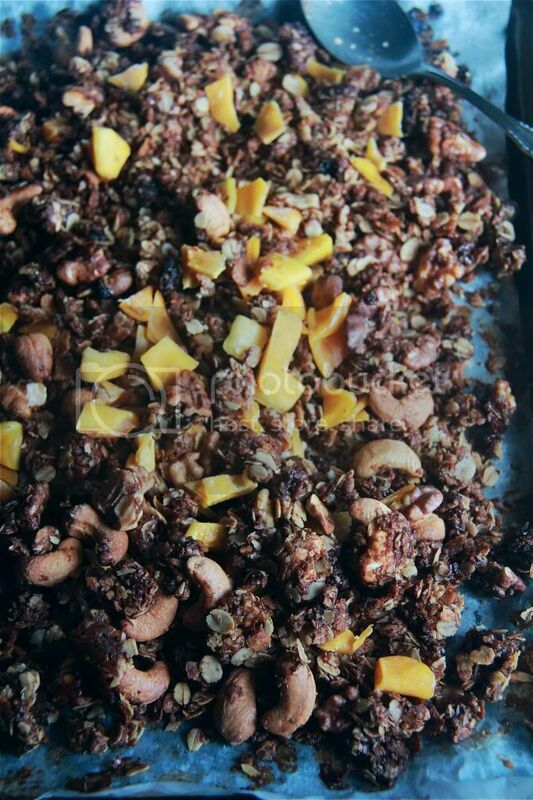 I got the inspiration for this granola from love letter cookies leftover from the recently concluded Chinese New Year celebrations. They are really good cookies, but there were just too many. I realised that when crushed, they greatly resemble cereal, which eventually led me to conclude that they would be awesome granola material. My decision to make granola was further cemented when I found a pack of gula melaka in my fridge. Love letter cookies are extremely coconutty and gula melaka and coconut pairs really well together. 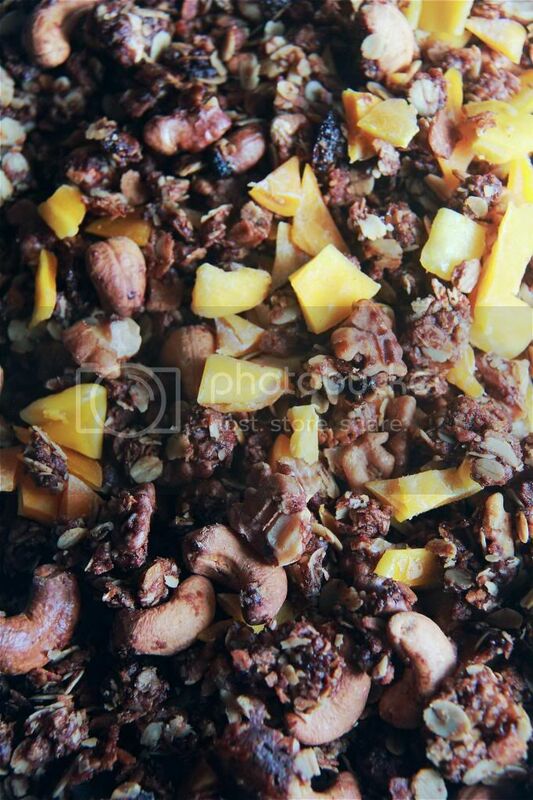 Since the granola was taking a tropical turn, dried banana seemed like the perfect dried fruit to throw into the mix. I couldn't find any though, so I got dried mango instead. On hindsight, I should have thought of dried pineapple but I found that the oat mixture itself is so delicious that the fruits are practically redundant. As for the nuts, I chose walnuts and cashews. Macadamia nuts would have been a great choice too! I feel that I must issue out a warning about this granola - the clusters are tremendously addictive. At first I took a few just to sample, and minutes later I was popping every alternate piece into my mouth as I was transferring them from the tray to a jar. I would say that these are too good to give away, but I think "they are so good that you must give them away" reflects the situation and the extent of its deliciousness more realistically. Preheat oven to 160C. 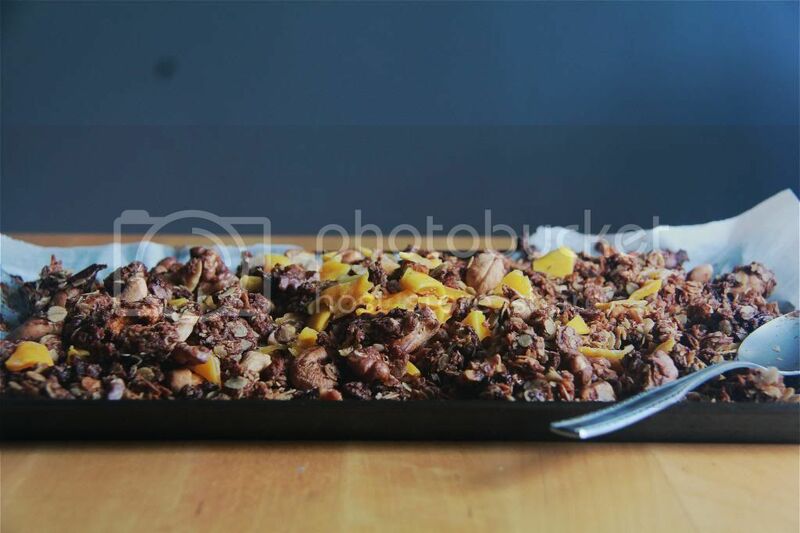 Prepare a large baking sheet. 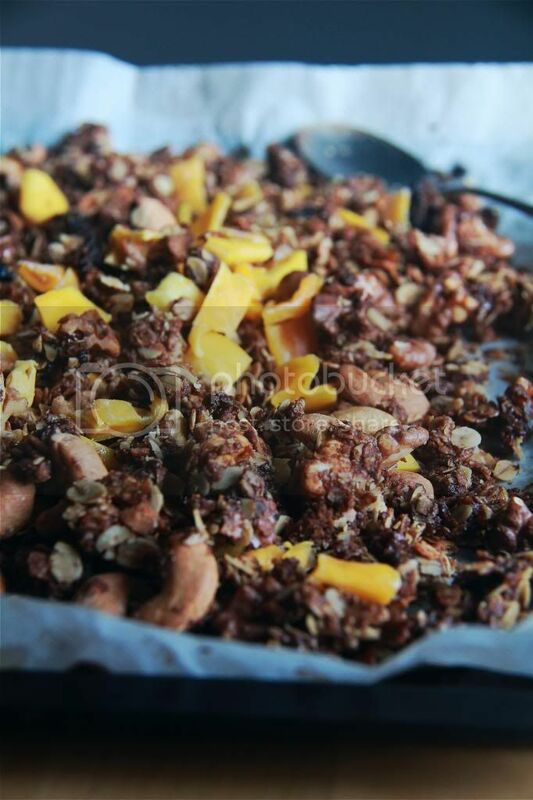 Combine the oats, cookies and nuts into a bowl. Combine the palm sugar, oil and salt into a saucepan and stir over low heat until the sugar has dissolved. Pour over the oats mixture and stir until evenly coated. Empty the mixture onto the baking sheets, spreading them out evenly. Bake for about 30 minutes, stirring every 10 to 15 minutes. 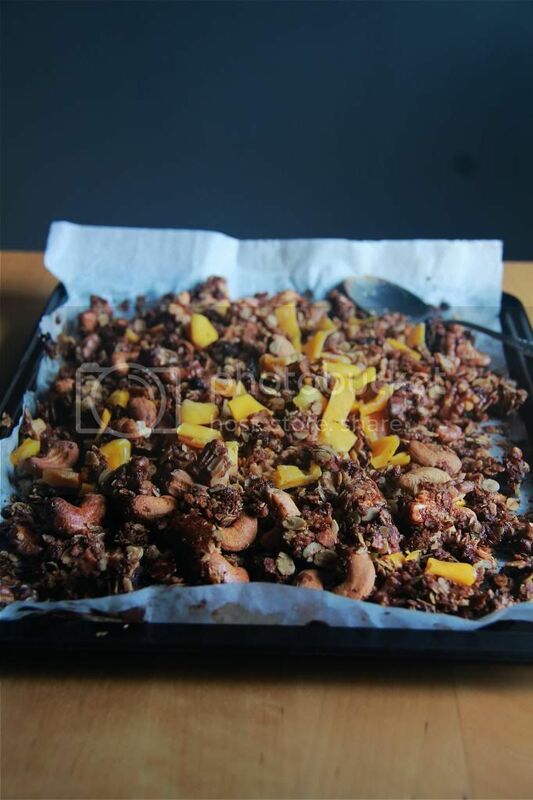 Don't disturb the granola too much if you want more clusters. Cool on a baking rack for at least 10 minutes before eating. earl grey white chocolate bonbons.